The Makita 9237CX2 is excellent for avid detailers who don’t trust their vehicle to anyone else. The variable speed control and powerful motor make this polisher easier to use than many circular polishers, but still very effective. Makita 9237CX2 7 inch Rotary Polisher has a variable speed from 600 to 3000 rpm for super slow buffing to aggressive polishing. The electronic speed control maintains constant speed under load. 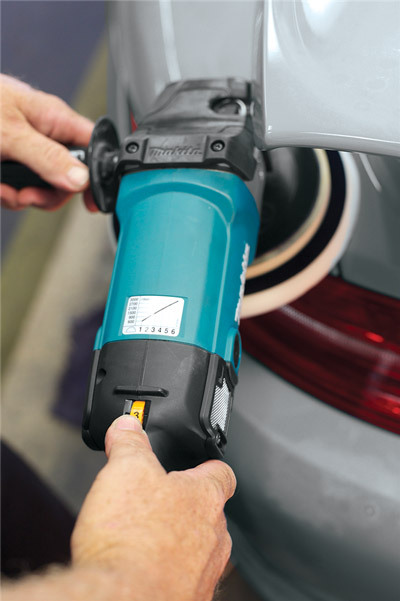 The lock-on button allows you to use the Makita continuously at one speed. This button also allows you to use the machine as a sander on your wood projects. The machine weighs only 7 pounds so you can work for extended periods without tiring your arms. The Makita 9237CX2 features a large, comfortable handle and a convenient spindle lock in the polisher to make changing pads easy. Product Description 10 Amp motor, Variable speed (0-3,000 RPM) , Pre-set speed setting dial (from 600-3,000 RPM) for maximum control, Includes hook and loop pad and hex wrench, Weighs 7 lbs.